2K Sports has forked over $1 million to Wade McGilberry for pitching the first perfect game in Major League Baseball 2K10 - on the very first day of the contest. 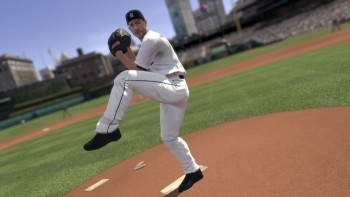 In January, 2K Sports put out the challenge: It was so confident in its "superior pitching and hitting mechanics" that it offered a million bucks to the first person who could throw a verified perfect game. Perfect games are rare beasts in the real world (only 18 since 1880) but not so much in the videogame arena, where predictable systems and "gaming" make them far more common. Of course, even with MLB 2K10's upgraded systems it was inevitable that someone would pull it off sooner or later; as it turns out, it happened sooner, probably much sooner, than anyone expected. Wade McGilberry, a 24-year-old gamer from Alabama with a pitcher-perfect name (oh yes, I went there) managed to toss a perfect nine on the very first day of the competition. "I never thought I'd actually win a million dollars playing a video game, it's all still sinking in for me," he said. "The game itself was fantastic - I'm glad I bought it either way - but I have to say, this is a nice return on my investment." If 2K Sports was annoyed about the entire basis for its contest being blown out of the water within 24 hours, it did a good job of covering it up. "This competition was an amazing ride for us," Jason Argent, 2K Sports' vice president of marketing, said in a statement. "We honestly had no idea what to expect. But the incredible response from the fans and the buzz surrounding the competition was nothing that we could have ever predicted. Throwing a perfect game in Major League Baseball 2K10 is anything but easy. We congratulate Wade on his successful pursuit of perfection." "Amazing ride" it may have been, but I wouldn't hold my breath for another one when MLB 2K11 comes out.